Group of monuments at Mahabalipuram. Explore South India with a customized tour of 11 days that we have tailored exquisitely to cater your travel needs and interests. 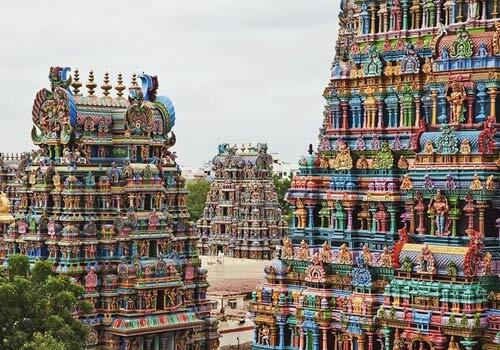 This private tour of South India will take you to the marvelous temples, pristine beaches; help you admire the amazing Tanjore Paintings, unique classical dance form- Bharatnatyam and the harvest festival Pongal along with many other attractions. We include sightseeing of Chennai like Fort St. George, Fort Museum, St. Mary's Church and Museums. Visit the ancient port of Pallavas at Mahabalipuram, Arjuna's Penance, the temple town 'Kanchipuram'. Visit Raj Niwas, Sacred Heart Church and Sri Aurobindo Ashram via Pondicherry and then move to Tanjore. 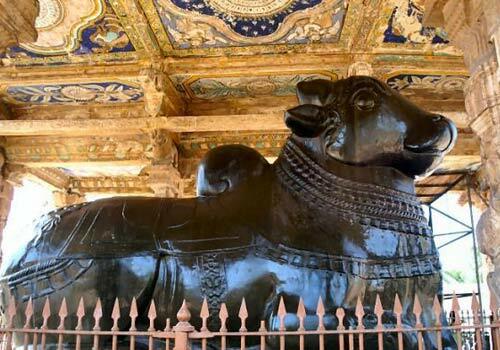 Visit the royal Brahadeeswara Temple, Nandi (Bull) and the Royal Palace complex and admire the intricate Tanjore Paintings. 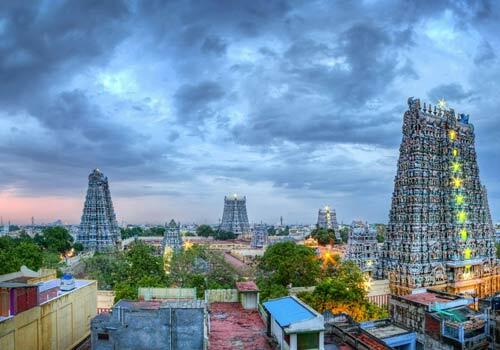 Your personalized tour will also include a visit to Madurai, popularly known as “Athens of the East” en-routing Trichy, nestled in an island called Srirangam. Visit to Meenakshi Sundareshwar temple known for its remarkable pillars and corridors along with a joyful boat ride for an enchanting lake view and Wildlife Sanctuary of Periyar will also be there for you during the tour. Cruise through the Houseboat " Kettuvalam " at Kumarakom and Vembanad Lake while enjoying sightseeing. Visit the St, Mary's Forane Church and the well-known Champakulam snake boat construction yard, also admire the Murla paintings. Experience the exotic wildlife at Kumarakom Bird Sanctuary and observe the daily life of the native alongside the backwaters. At Cochin you will get the glimpses of Chinese fishing nets, witness an Indian classical dance performance in the evening and the heritage houses having the influence of Portuguese style. 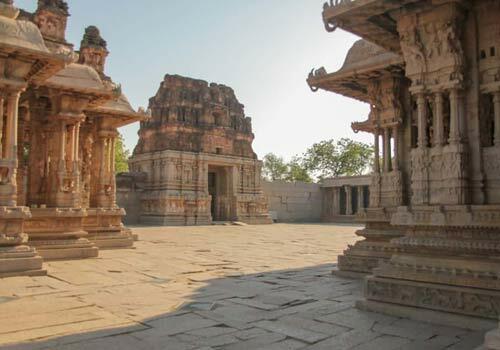 Therefore, this tailor-made tour of South India will give you the best in just 11 days. Welcome India, You will be received by our executive and transfer to your pre-booked Deluxe / Luxury hotel. In afternoon take sightseeing tour of Chennai. 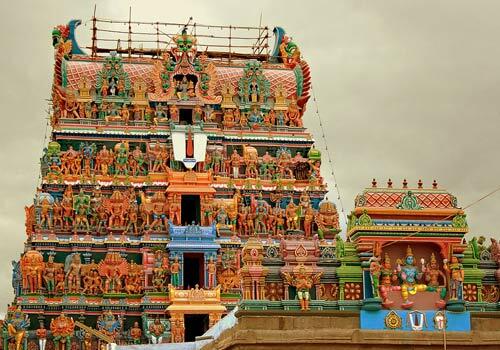 Chennai is well-known for its cultural heritage & temple architecture. The region was served as an important administrative, military, & economic centre dating back to the 1st century. It is also Called “the capital city”, popularly regarded as the 'Gateway to the South' represents a culture that is distinctly different from that of northern India. In the Hotel you will have a brief description of your tour and the representative will hand over your documents regarding the tour, Overnight at Hotel. 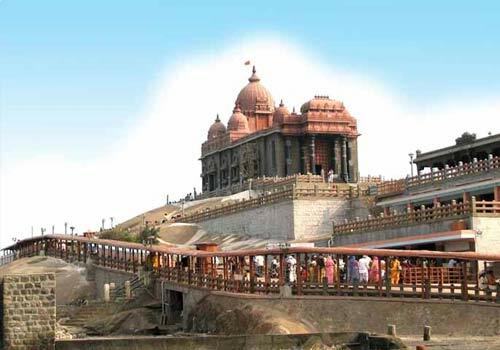 This morning your tour begin with Chennai sightseeing a seaside destination and a buzzing place with colourful shops. Visit Kapaleeshwar Temple one of the most famous landmark of Chennai followed by Sri parthasarthy Temple, one of the world’s longest beach Marina Beach, Fort st. George, National Art Gallery, Apart from this two finest examples of architecture are San thome and Rippon building (Drive past) At evening an aromatic walk through spice markets where you learn all about India spices Overnight at Chennai. Breakfast at Hotel in Chennai, Leave for Mahabalipuram (56km/1hr from Chennai) Enroute visit to Kancheepuram (75km/2hrs). 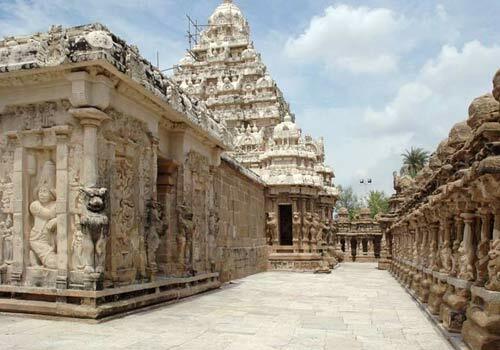 Kancheepuram considered as one of the seven holiest places of India visit famous temples like Ekambaswara Temple, Kailasanatha Temple, Sri Kamakshi Temple and Varadarajaswamy Temple. After Kancheepuram sightseeing continue drive to Mahabalipuram , lies on the Coromandel coast which faces the bay of Bengal. The group of monuments of Mahablipuram are classified as a UNESCO World Heritage site. On arrive Check in to hotel, Visit of Mahabalipuram monuments like rathas (temples in form of Chariot), Mandapas(cave santuries), giant open air rock relief and Shore Temple. Evening back to hotel, Overnight at Mahabalipuram. Breakfast at Hotel, Leave for Pondicherry (2hrs/100kms) one of the most sought after destination of South India. Now it is known as Puducherry . On arrive check in to hotel. visit Auroville Township, Aurbindo Ashram, Manakula Vinayagar Temple, French war memorial and Promenade beach, Evening enjoy Rickshaw ride through French colony, Overnight at Pondicherry. Breakfast at Hotel Leave for Tanjore (180km/4hrs) En route visit to Chidambaram which famous for Thillai Natraj Temple this temple dedicated to Lord shiva. 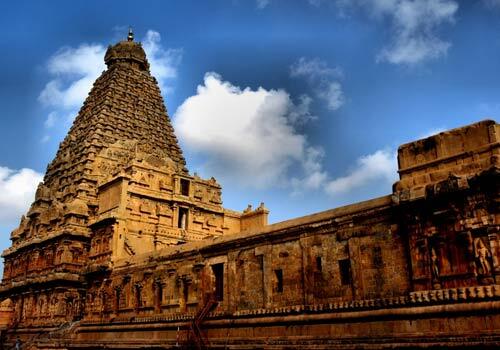 Post your visit at temple continue drive to Tanjore , On arrive relax. Overnight spend at Tanjore. Breakfast at Hotel Proceed to visit Brahadeswara temple(or the big temple of God).The temple tower rises to a height of 15mts from a square base of 29 mts and then tapers off, making a total of 66mts. Later leave for Madurai, Enroute visit of Trichy temples which included Rangnath Temple, Rock fort Temple and Jambukeshwara Temple. Continue drive to Madurai, Overnight at Madurai. Breakfast at Hotel, Full day Madurai sightseeing, visit, Meenakshi Amann Temple located on bank of Vaigai river. Followed by visit to Tirumala’s palace and Gandhi Museum . Later Night ceremony of Madurai, Overnight at Madurai. Breakfast at the Hotel, After breakfast, leave for Alleppy, Board the houseboat and enjoy the Delicious lunch, Evening enjoy the floating tour of alleppy backwaters. Enjoy on board dinner, Overnight at Alleppy. After enjoying your breakfast at Alleppy houseboat leave for Cochin. Cochin is a major port city also known as queen of Arabian sea. Here visit famous monuments and landmarks like Mattancherry palace, Paradesi Synagogue, for kochi santa cruz and st francis church. Evening spice markets and Kathakali dance performance. Overnight spend at Cochin. Breakfast at hotel, Leave for Cochin Airport Travelogy India representative would drop you at Cochin Airport. Tour Teminates.